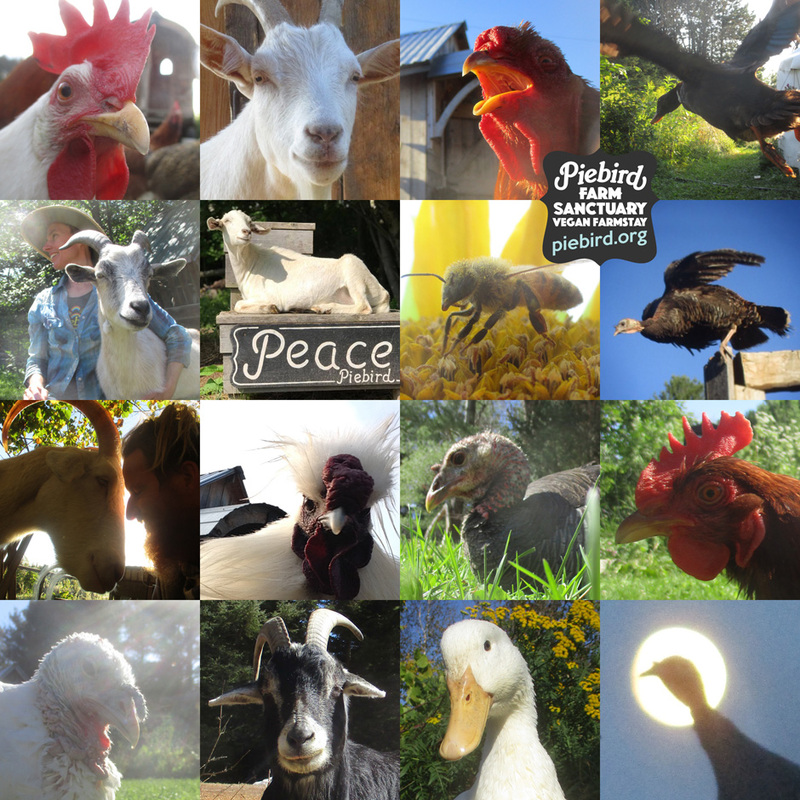 Here at Piebird Farm Sanctuary we have spent the last twelve years building a place of Peace, giving it a place to happen. Building a place where others can come share and participate and contribute. Now we’re taking a step towards adding another way that sanctuary here can be meaningfully shared — another way that sanctuary can more meaningfully contribute to animal-personhood — by community. Co-operative community, living on the land and living in service to furthering Animal Personhood and Animal Liberation. A cohesive community is unlikely to emerge if its members do not subscribe to shared common values. Simply this is Animal Liberation, especially as applied to sanctuary. While values must be shared, the structure should recognize the need for diversity in the community. We are keeping all of this intentional vague to allow a truly collaborative vision to emerge. Quiet honestly, we are open to most possibilities of community as long as they in some way address the one need the sanctuary has: always move towards (rather than away) Animal Liberation and the long-term security for the sanctuary residents. Initial cooperative seed members/founders will need a financial investment for land and housing. The wonderful part is that we already have the land so the land/money scramble isn’t there like it could be for some communities. This isn’t a “start-up” — it is an “evolution” of an existing awesomeness. We are an un-status-quo operation with all sorts of un-status-quo creative ideas of how it could work! It’s just a matter of founding members deciding how best to work together to utilize the land and existing structures, how to work towards, through shares and investments or land dividing and co-op housing, an attainable and sustainable legacy for the animal friends who are also considered equal members of the community. We just need the right dedicated humans to contribute. If you think this could be you, read on! We are better at communicating realities and expectations in actual in-persons conversations. If we haven’t yet met, then perhaps arrange to book a stay come Spring, we re-open in April and being here in person is the best way to see how our energies merge. If you are interested but not yet ready for such a long-term change, or do not have the personal or financial commitment at this time there is also our Residency Experience here at the sanctuary. We are all shaped by the variety of our experiences, but we share more similarities than differences. We live in a culture of separation: competitions in popularity, divisions of ownership, detachment from responsibility. These have consequences on the lenses through which we view the World. The best way to break free of all that is to build community. Creating community is systemic change. For us, sanctuary has always been about sharing: sharing the enjoyment, sharing the awareness, sharing the exploration — evolving into community means for us to all take a meaningful step backwards and share more. As a sanctuary we create the space for animal persons to be free — but that isn’t to say that their freedom is something we’ve given to them. Yes, we tear down strife and we uplift — but the liberated raise up their own freedom. None of us give others their freedom, or “rescue” them to their freedom. Their freedom is theirs and they have it within. We just help lift whatever oppressions are holding them down. Freedom carries with it the responsibility of being part of community. And that commitment means: that our own individual freedom must bloom the freedom of all others too. The freedoms that we ourselves are given require of us to give freedom to all. To uplift. As ethical vegans, we know veganism to be a necessity. But through our work as sanctuary, veganism become just one step in the long road of truly respecting personhood. Not killing, eating or exploiting someone is really just the least we can do. We can do more. We can see all animal-persons as the sovereign individuals they are. Self-governing and self-determining — each with consent over their own body and life. The friendships became so much more respectful the more respect we added to them. Such is the nature of friendships. Our sanctuary work became to demonstrate the happy moral certainty of such friendships: a meaningful happiness that gifts meaningful happiness. We envision that community can expand upon this immensely. The nature of oppression is boring, while the spirit of resistance is inspiring. It’s imaginative. Many of us are naturally attracted to give our efforts to the resistance simply because it is more beautiful. It is there where love lives. It is there where freedom grows. It is there where goodness comes easy. 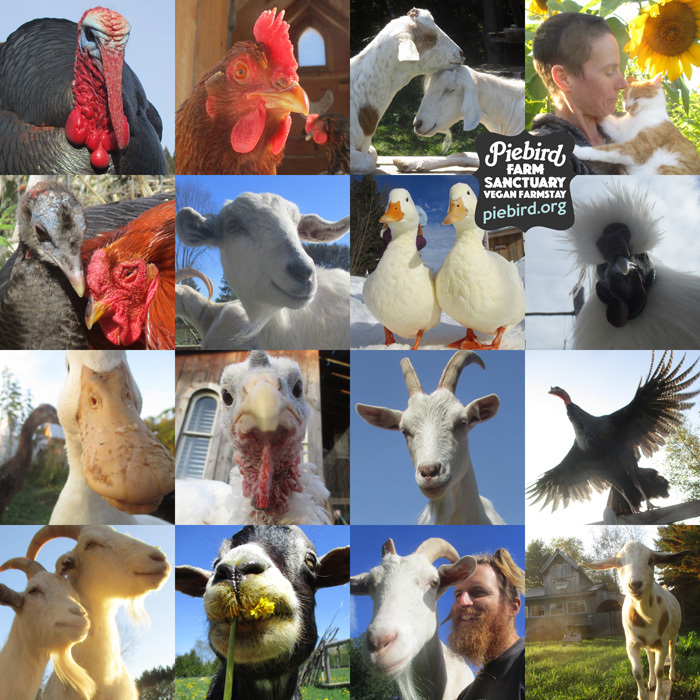 It is there, amid the creative powers of liberty where we do our best work as Piebird Farm Sanctuary. It is there, where we orient ourselves in launching Peacebird Animal Liberation Cooperative. Love is our creative force. Love enables. Love empowers. Love inspires. Love allows us to embody and express the deliberate creation of Peace. When the energy of our attention is a steady expression of love, the work of bringing about the presence of Peace has more ease to it. Transformation is a creative act, so in fostering any change we must enable creative transformation. We do our best to be joyful and to have the ideas we embody and represent be welcoming. We realize that the positive changes we seek (in how we govern ourselves, and in how we may inspire others), these do not often come from the analytical spheres of our being, but rather they come from the poetry of life. Loving example has more followers than prudent reason. With all of the understandings we have and hold shining bright, we create a place of beauty and meaning and love and joy, where participants are invited through self-inspiration to create their own mystical experiences. As a sanctuary, we have to live love loudly, and show what non-exploitative, non-hierarchical relationships look like. New ideas of peace, justice and love are always germinating, seeking to find their way into the light. As a sanctuary, our felt-responsibility is to give new ideas and new ways a space to be, to allow them to take root in life. Everywhere, new ideas are opposed by the inertia of the dominate order. Culture has a relentless momentum that is unkind or at least un-noticing to gentle voices of change. Our role is to brighten the space where those voices speak. They are speaking already: The chicken-friends are telling stories of metamorphosis, the goat-friends are humming tunes that tell of shifts, the turkey-friends are singing songs of great transition. Our role is to make it enticing for all to listen. To be present. To participate. We speak of the true meaning of sanctuary. Not necessarily the popular application of sanctuary. To avoid endless circles of exploitation then reformation, sanctuary should be a true revolution. We all witness dire forms of animal-exploitation be replaced with more-mild forms of exploitation that are still ahead of the status-quo curve but way behind true respect and the equality that’s due. Sanctuary should present a revolutionary vision. Always. We very much see it as a revolutionary project to inspire society to have respectful relationships with all the animal-persons we share this world with. So sanctuary must be a model of how the revolution could be pursued, and some indication of what to do once we get there. On the day after the revolution that is Animal Liberation, our communities will need to have been given more tools than only clever tee-shirt phrases and an affinity for cuteness. They will need to have been given the experience as to how relations to animal persons must respect autonomy and individual sovereignty. If the overthrow ends only the exploitation of use and does not gift understandings of equality, then our achievements will be lacking. It is with these thoughts that we begin this conversation of community. If you are interested in this kind of life then do reach out.